With the Overground, Crossrail and the London Underground upgrades having dominated (and continuing to dominate) the Capital’s transport scene, it’s easy to forget that the next few years will see major changes for its surface terminals as well. Nowhere is this more true than at Kings Cross, where a major redevelopment project that arguably started almost fifteen years ago is now close to completion. 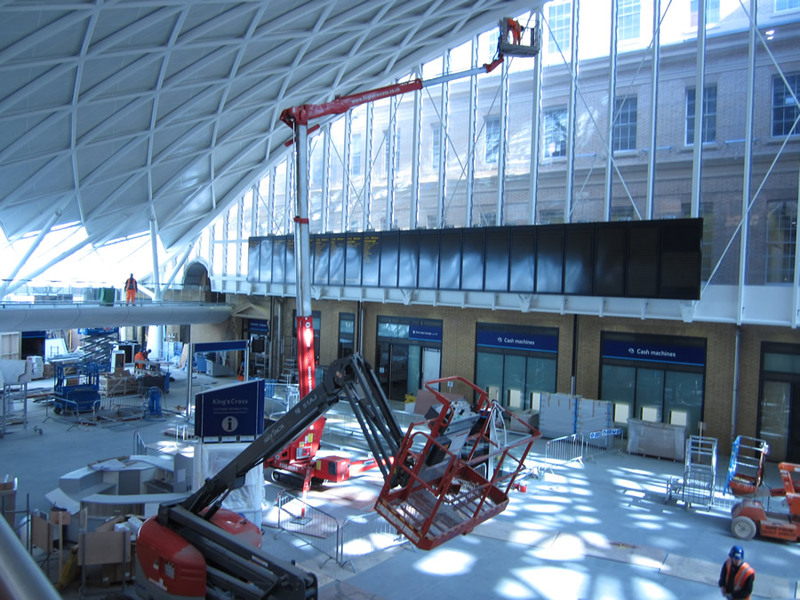 It is a project that will reach an important milestone on Monday 19th March, when the new Western Concourse will officially open to passengers for the first time. 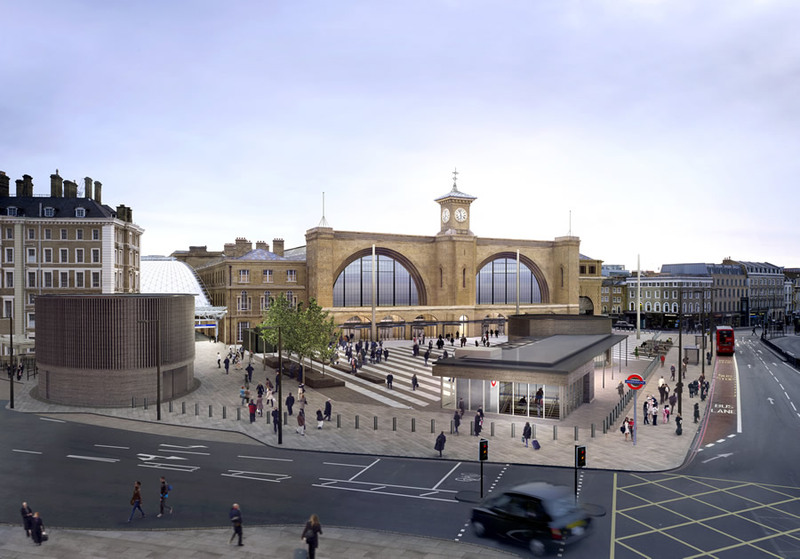 The opening will not mark the final completion of the Kings Cross project – that will not come until late 2013 when the green canopy that currently hides the impressive facade of one of London’s oldest stations will finally be removed. 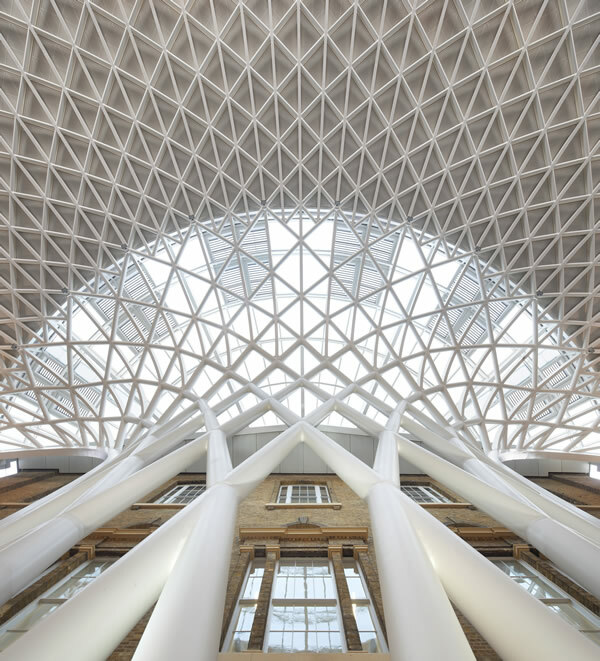 It will, however, arguably mark the biggest point of change for passengers – because from Monday the way-finding through Kings Cross will change significantly. Before we look in more detail at the Western Concourse (a site we last visited back in August 2011) it is worth pausing briefly to look at the station’s history. 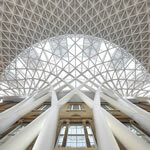 Originally designed by Lewis Cubitt, it is one of only six Grade 1 listed stations in the United Kingdom. 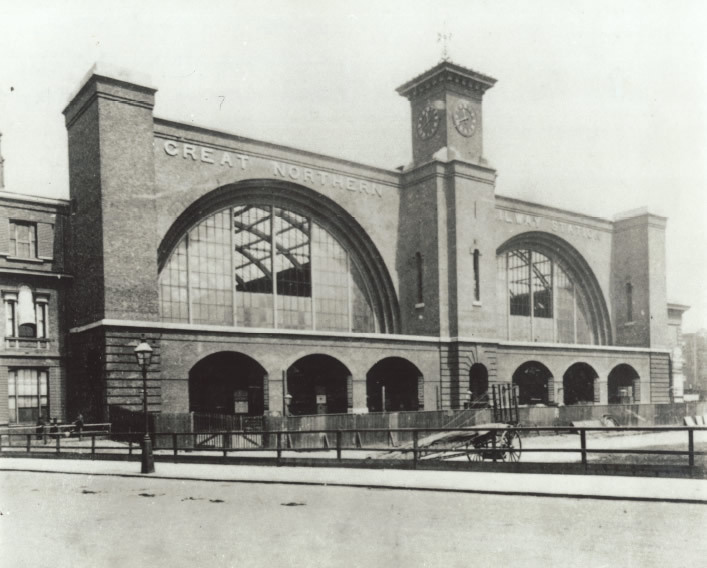 The double-arched structure of the main shed reflects the fact that when the station was constructed in the 1850s it contained only two platforms – something that seems hard to comprehend given the number of platforms located within the same shed today. 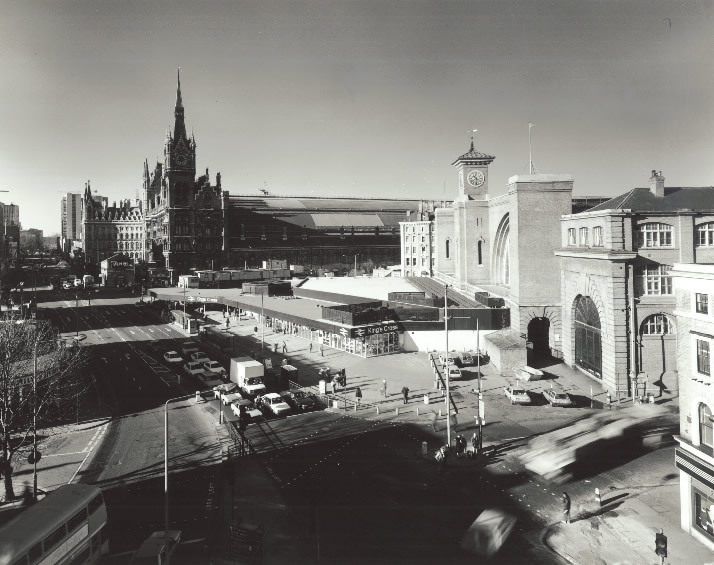 During the early years of its existence, the station’s impressive frontage stood proud along the Euston road, with the path of the river Fleet giving St Pancras Road (and the Great Northern Hotel that was built alongside the station) its distinctive curve. In the late 1870s, however, Cubitt’s original frontage was covered for the first time. 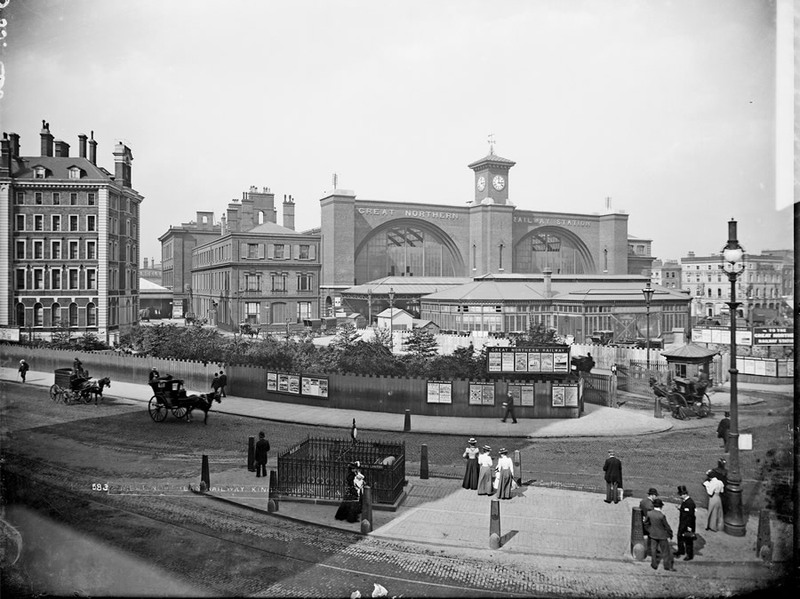 The changing needs of the railway meant that more enclosed space was required, and the character of both the station’s facade and its forecourt began to change. This ultimately resulted, in the seventies, in the creation of the green “temporary” structure which graces the front of Kings Cross today. It is the removal of this green canopy that forms the fundamental objective of the project underway today. This is not, however, just an aesthetic act. Kings Cross currently handles upwards of 47 million passengers a year and, as regular passengers know, deals with them relatively poorly. 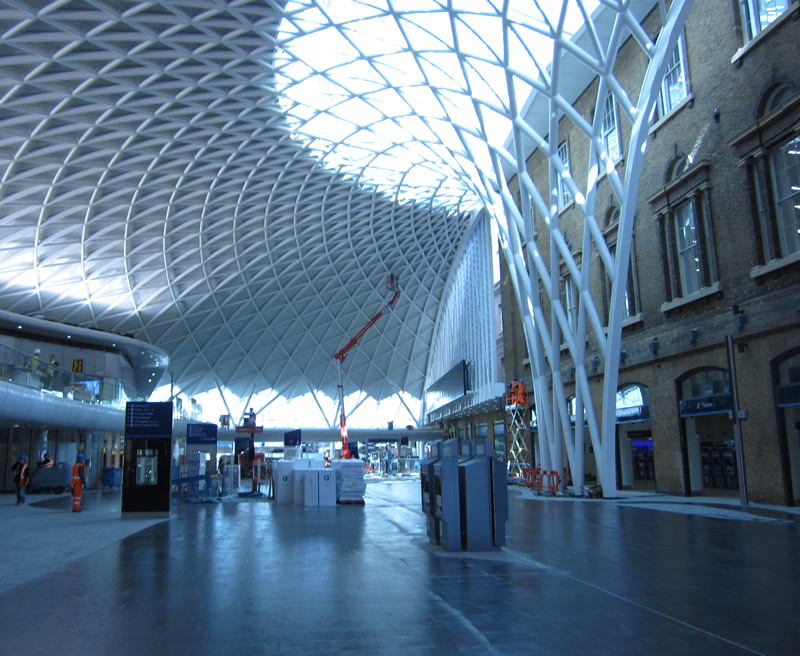 That’s a number that – as for many stations in the capital – is forecast to rise significantly, and thus a complete remodeling of Kings Cross was the only real option if this increased demand was to be addressed. The model above, which is located in the current concourse, gives a good idea as to just how drastic the changes will be. 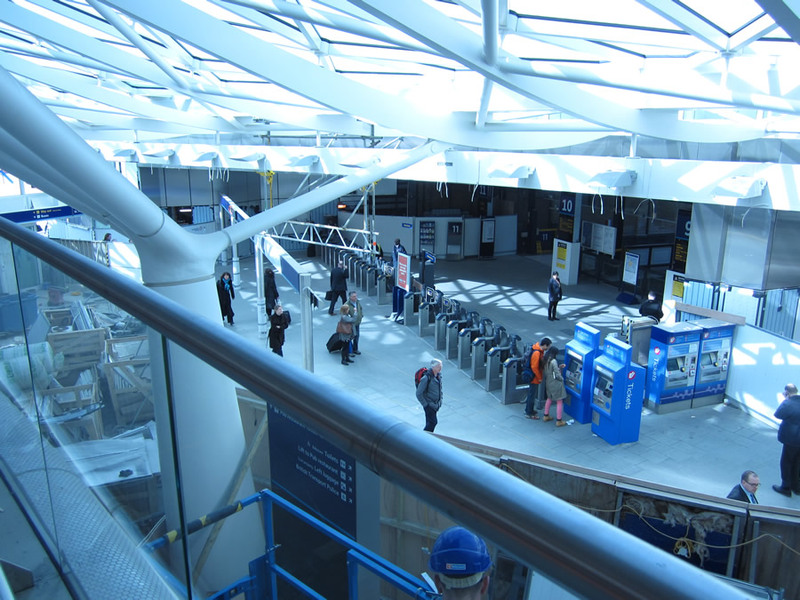 Sitting on the western side of the main train shed and connecting directly with the suburban platforms to the north, the new concourse effectively shifts the georgraphical centre of the station significantly westward. With the (still relatively new) St Pancras station complex sitting on this side of the station, this is a move that largely makes sense. It will mean, however, that passengers used to letting their subconscious govern their route from Underground (or road) to their prefered surface-level platform will need to engage their higher brain functions again, at least temporary. 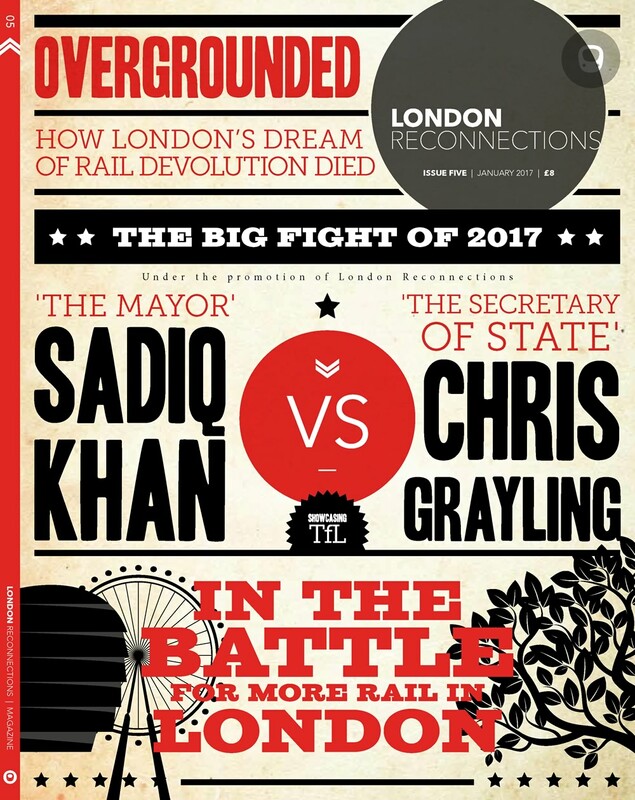 This is because the wayfaring at Kings Cross really will be radically restructured. 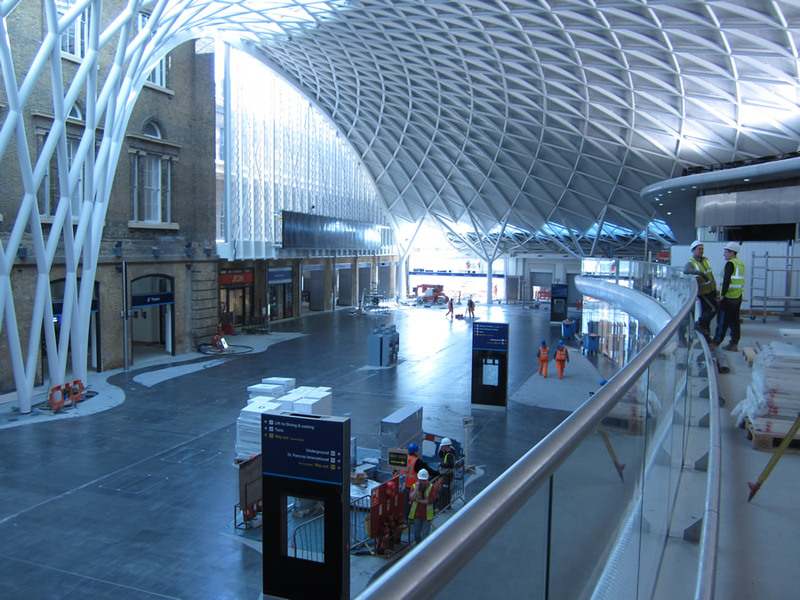 The new concourse, once open, is clearly intended to effectively give Kings Cross an almost airport-like split between “arrivals” and “departures,” and to facilitate a similar split between commuter and long-distance traffic. Just how this is planned to happen will hopefully become clearer shortly. The new Western Concourse itself really is an impressive structure. 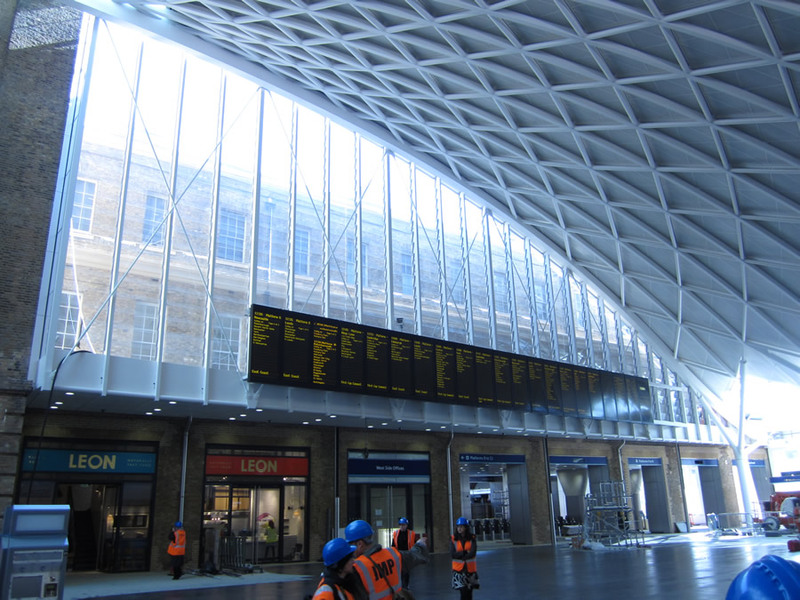 Whilst modern, it does feel like a building that has been engineered as much as designed, something that fits well with the overall feel of Kings Cross (a station that, whilst impressive, was very obviously an “engineered” structure itself). The picture above gives a good overall view of the concourse and helps provide some visual context to its layout. 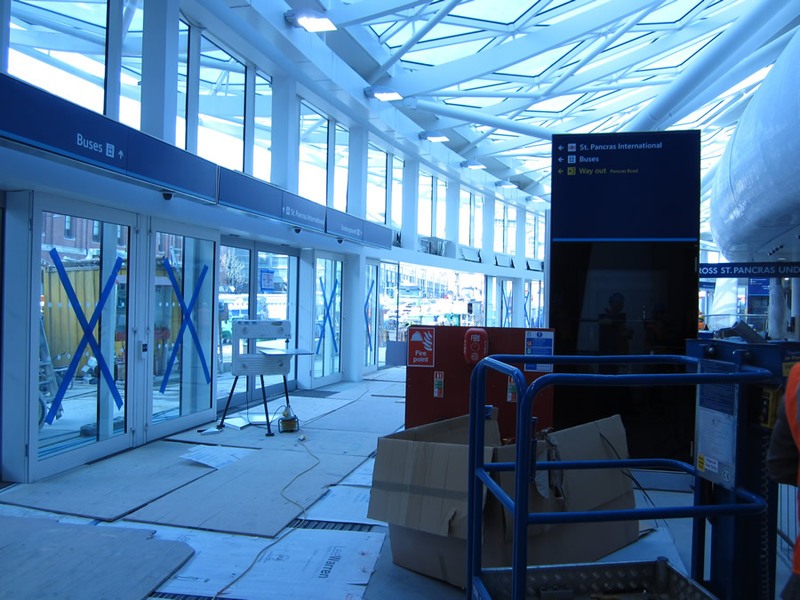 To the left of the photo (the northern end of the concourse) out of shot are the suburban platforms, to which we will return later, to the right is access to Euston Road – both through dedicated doors and the newly-hollowed-out ground floor of the Great Northern hotel. The boards on the left sit in front of the (now rebuilt) “bomb gap,” the result of heavy bombing during WW2. The boards on the right sit over the departures gateline through which the main shed is now accessed. 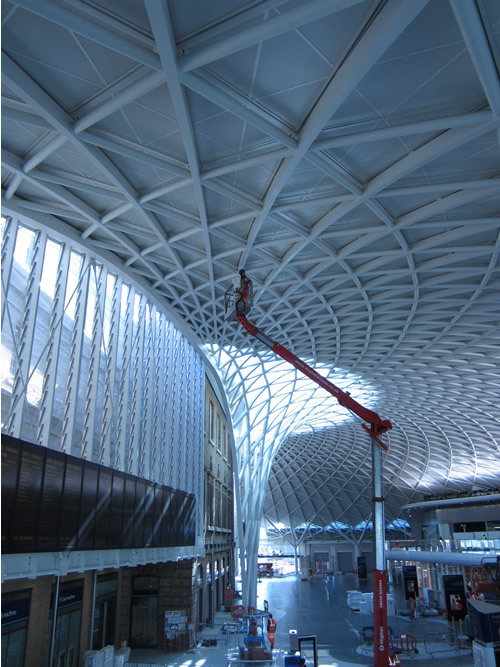 In the centre sit two of the most striking features of the new concourse – the supporting funnel and the new ticket hall. The funnel, along with several smaller supports scattered around the periphery, support the full weight of the roof. At first glance it may seem like an architectural flourish, but again they are as much an act of engineering as they are architecture. 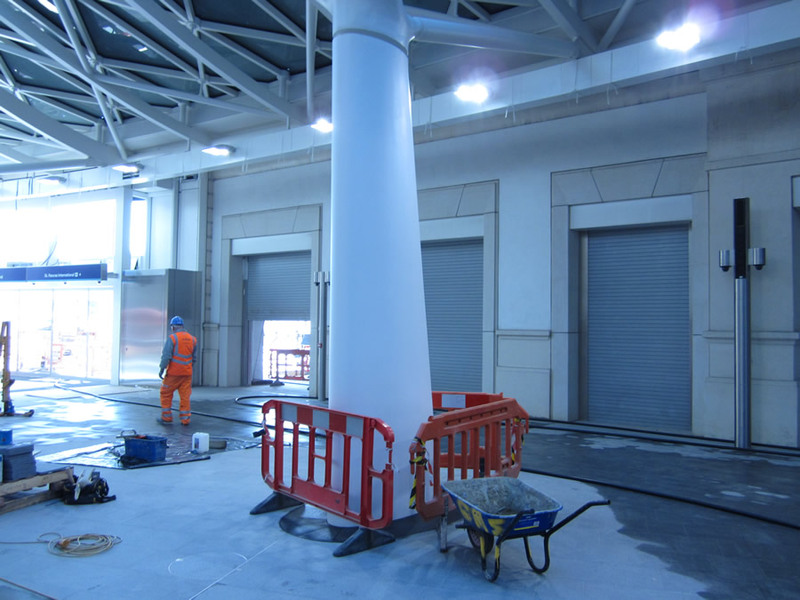 The new concourse sits directly above the Underground’s new Northern Ticket Hall, and thus there are limited points at which the weight of the roof could be supported – the funnel is the solution to this problem. Behind the funnel can be found the new ticket hall. As we indicated in our previous article on Kings Cross, the plan was to restore the original 1852 ticket office located within the Western Range. This had closed in 1973, serving as plant and storage space until the current project began. This has now been completed, and the results are impressive. 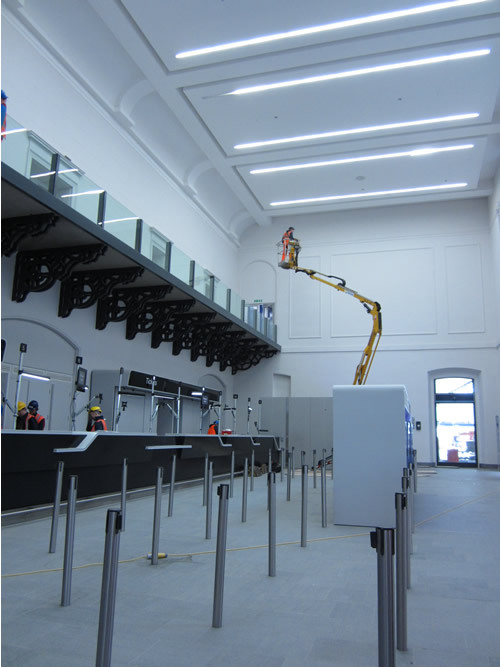 The new ticket hall is an open, airy double-height space (the the badminton court previously located on the the second floor being an acceptable casualty of the reconstruction). Just how it will cope with day-to-day usage remains to be seen, but it looks likely to be a welcome improvement over the current setup. South of the new ticket hall sits the new main shed departures gateline. 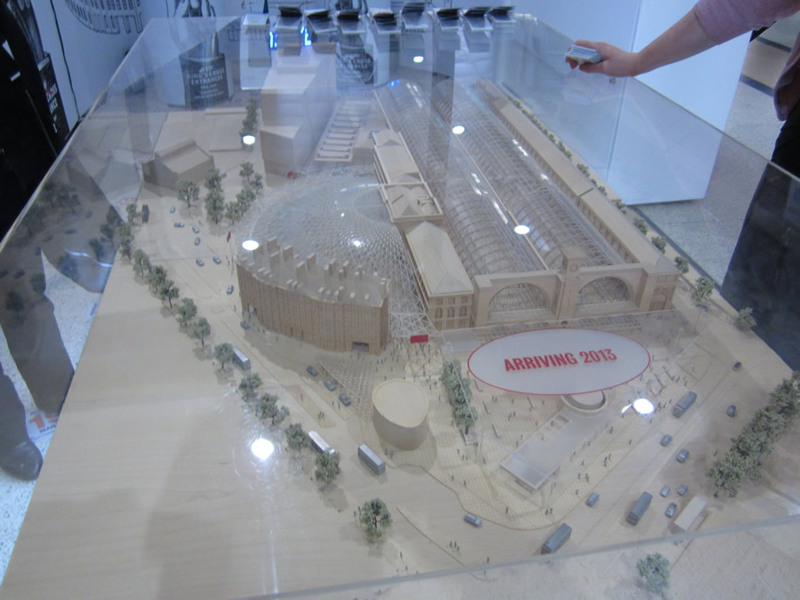 The photo above shows this, and also gives a good idea of the new concourse’s relationship with the old Western Range. It sits in front with direct attachment minimised, which gives both a genuine sense of space and allows some appreciation of the old building lurking behind. It is with this gateline that the new separation of passenger flows begins to become more obvious. 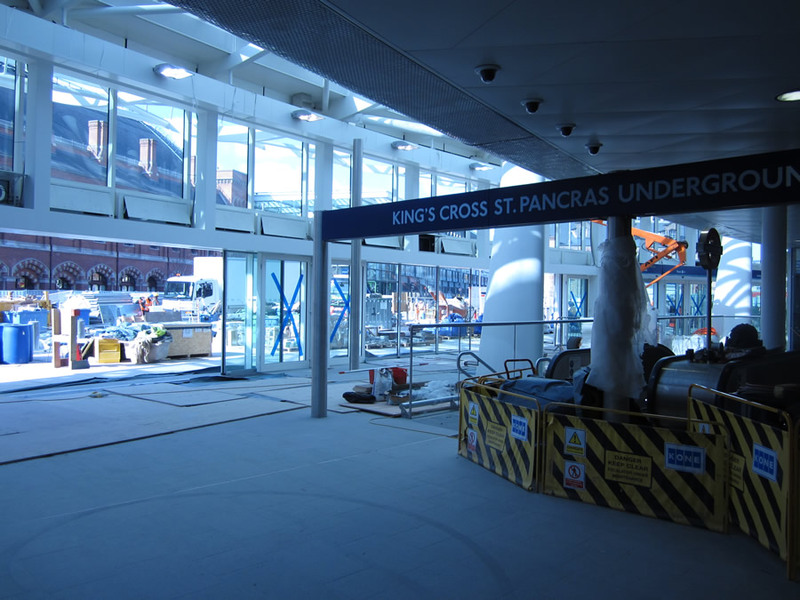 It is clear that the intention is to route those wishing to depart from platforms 0 – 8 through this gateline, and the signs for platform 8 can be seen just over the top of the construction hoardings in the photo below. 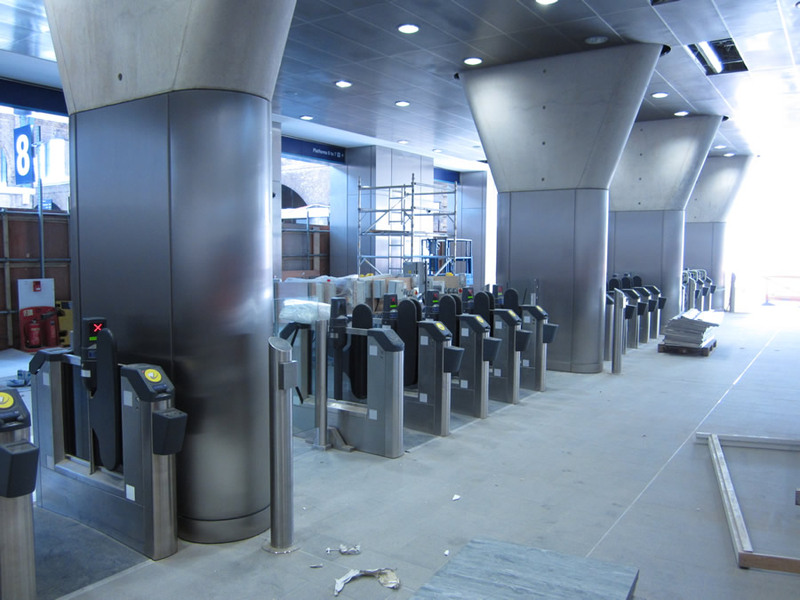 With departures being routed through this gateline, the original Cubitt facade thus becomes “exit only” – arrivals will leave the station via the front, helping to seperate the flows. 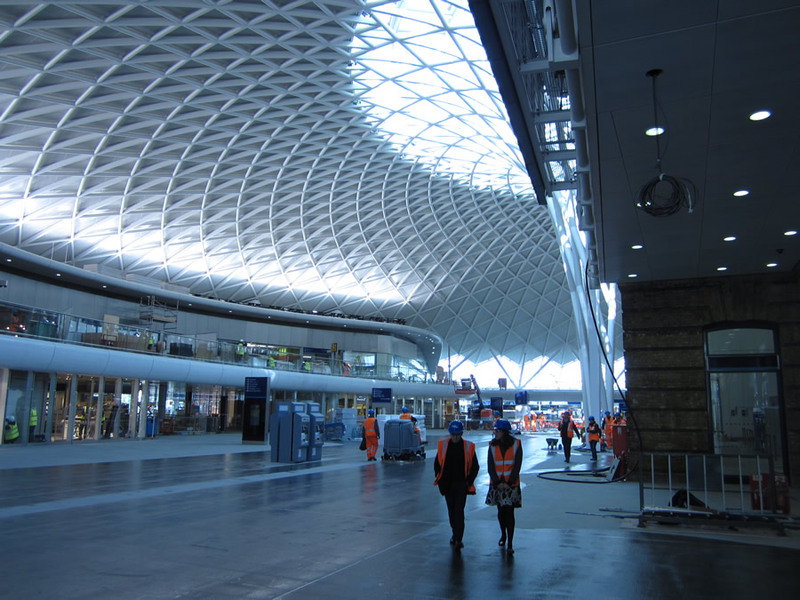 It will likely not be as smooth a process as Network Rail and the Kings Cross TOCs might like, as the flows cannot be entirely separated and the area directly in front of platform 8 will become a point of congestion during heavy traffic periods. It is clear that shifting back the buffers on platform 8 is intended to help mitigate this, but it will likely still not prove an entirely adequate solution. It is tricky to see, however, a better solution given the limitations of space, structure and cost. Looking away from the new works within the Western Range, the sheer amount of space within the new concourse soon becomes clear. Whilst the passenger numbers that pass through Kings Cross will see it filled soon enough, it still represents a massive improvement on the current setup. Perhaps more importantly, as the photos below show, it also means that commuter traffic now has a clear south – north run at the Suburban platforms, something that has been sorely missing for some time. Again, it is clear that this is deliberate, with the intention being to separate “fast” and “slow” passenger flows as much as possible. 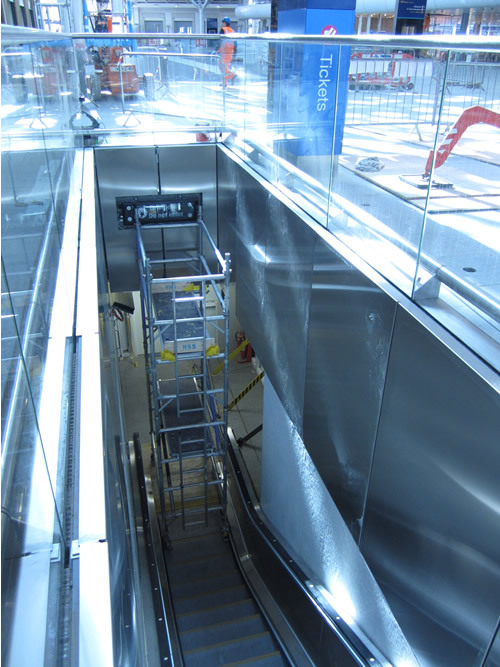 Adding to this setup is a tidal-flow escalator from the Underground below, which is clearly laid out to facilitate interchange to and from the suburban platforms. 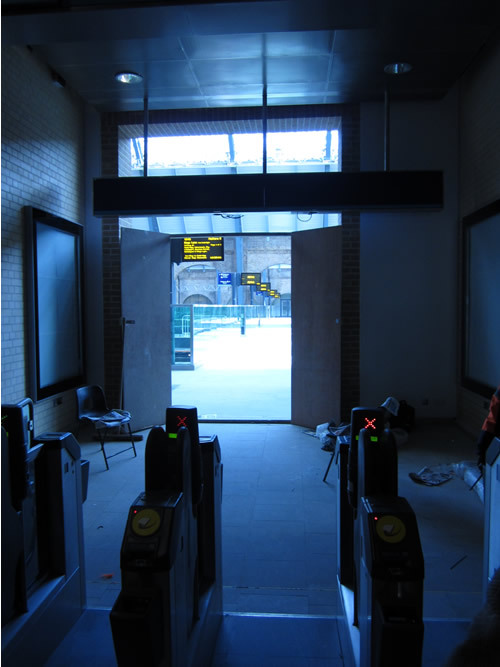 Extensive entrances and exits also sit on the western wall of the new concourse, providing another route for traffic wishing to access the station from the west and St Pancras. Indeed it is tempting to suspect that those wishing to interchange between the Subsurface lines and the Suburban may now be better doing so via the main Subsurface ticket hall and the western entrances to the new concourse. Finally, it is worth taking a look at the station’s mezzanine. 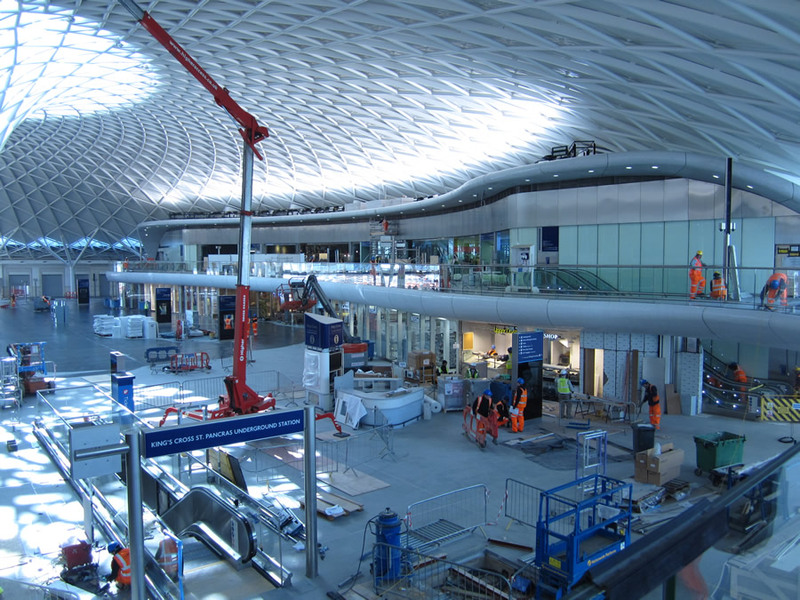 On previous form, it is seemingly inevitable that Network Rail’s press release on the station’s opening will focus on the amount of “retail” the new concourse features. What is clear from within the station, however, is that there has been some thought to just what is located where. 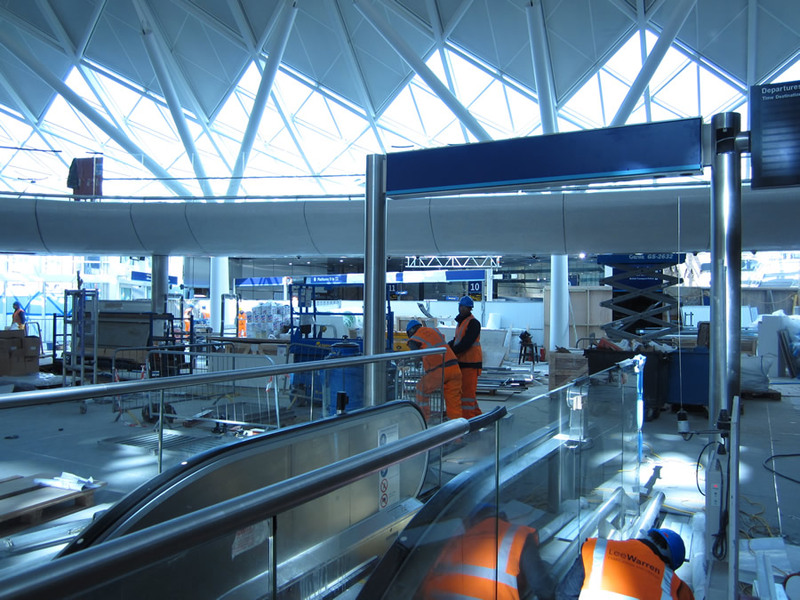 The mezzanine, for example, seems primarily populated with those shops and food outlets likely to be of interest to long-distance passengers (i.e. those who have arrived early and have time to spare). Given that the Mezzanine allows access to the platforms in the main shed via the new footbridge, the placement seems a rather subtle attempt to try and further segregate the flows. Just how successful it will be remains to be seen, but it’s an interesting approach to the problem. The bridge itself, which can be seen above from its access through the new concourse, will be one-way to cater to that departure traffic. It is perhaps narrower than in an ideal world, but time will tell whether it turns into a bottleneck point or not. The old Handyside bridge (pictured below) which the new footbridge effectively replaces, has been restored and donated to the Mid Hants Railway. 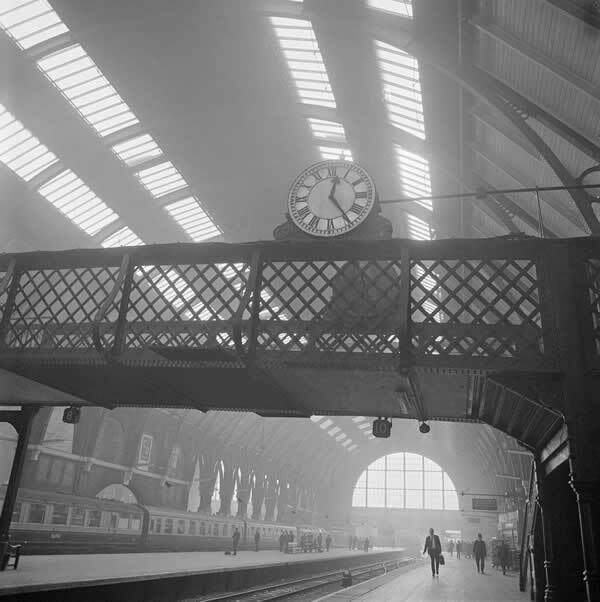 The old clock, however, will stay at Kings Cross – it will be re-sited on platform 8. Overall, the new concourse is an impressive space. It’s bright, open and – strangely – feels like it compliments the existing station building rather than eclipses it. 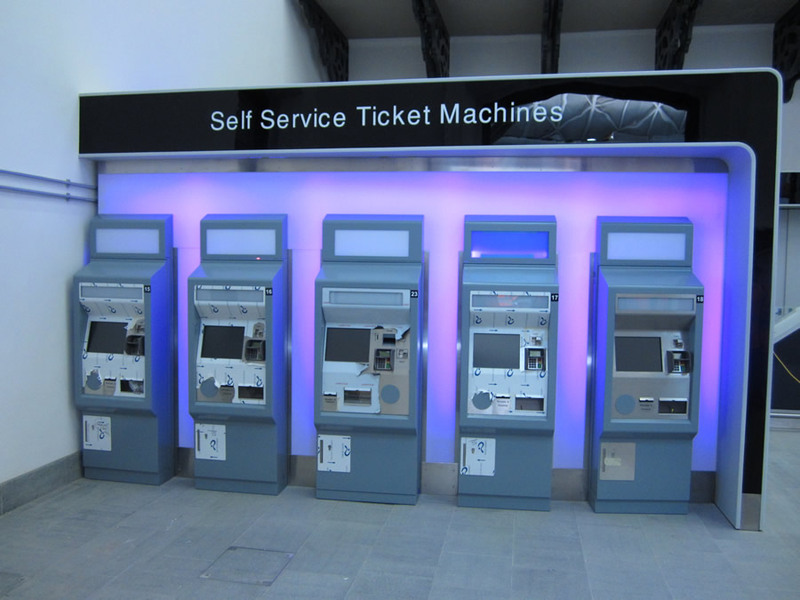 It will, however, force users to rethink their journey through it, thanks to the obvious attempt to redefine and segregate passenger flows by making the majority of passengers enter through the new concourse and depart via the old. 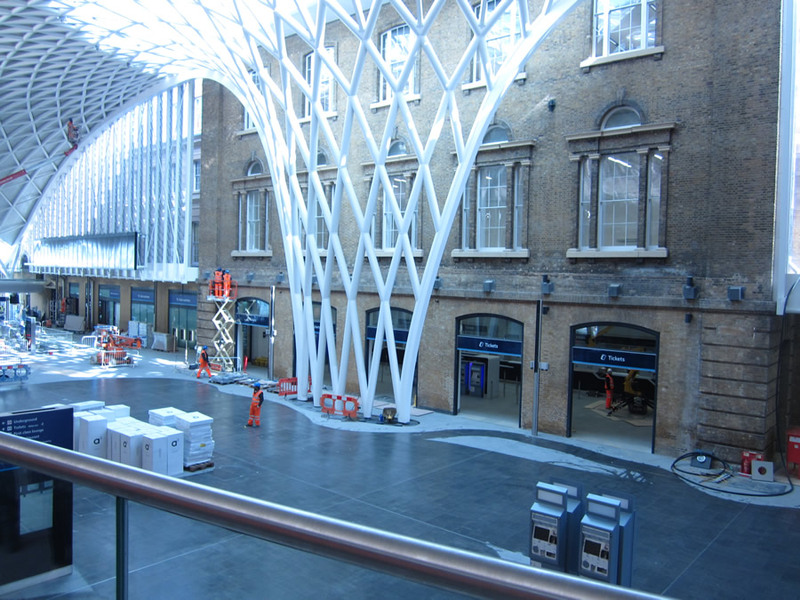 It is to be hoped that this redefinition is successful – Kings Cross has long possessed one of London’s least commuter-friendly layouts. In the short term though, this seems likely to cause some serious disruption, and minimising that on Monday will prove a major challenge for both Network Rail and the TOCs. That they are aware of this is clear – for some time now leaflets detailing the changes have been distributed at the station. History has demonstrated, however, that most people only become aware of changes such as this on the day in question. 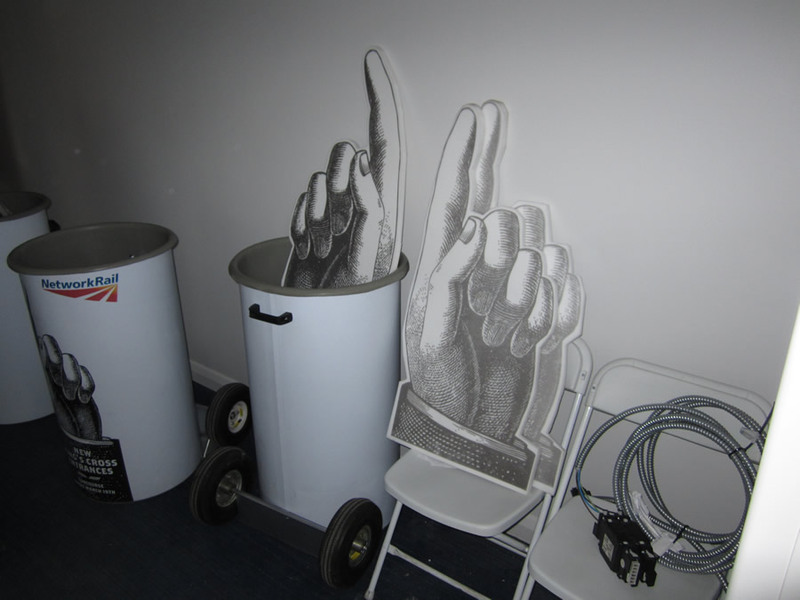 As the photo below – taken in one of the storage spaces within the new concourse – shows, this seems to be something that Network Rail are aware of and have plans to mitigate. Hopefully they’ll be successful.